Back to the 5-2 Diet for me this week with a 5-2 fast day today and on Saturday. One of the biggest challenges for me at this time of year if I’m trying to lose weight is that my fridge and store cupboard tend to be overful with Christmas leftovers. I know, for example, there’s a whole box of stollen in the cupboard, a LOT of smoked salmon in the fridge and even chocolate!!! And, I suspect that one of the reasons the 5-2 diet works for me is that it lets me work through leftovers of nice things just taking a couple of days out a week for 5-2 diet fast days. Although I am not normally keen on meal planning, on 5:2 diet fast days I do find it helps a LOT to work out what I am going to eat (and at roughly what time!). The last of my family left after the Christmas break today and so I had a fairly late start at my desk. I seldom eat breakfast and I certainly have no intention of starting on a 5:2 fast day, unless I happen to be feeling particularly hungry. Today I wasn’t…so the morning was nothing more that coffee. Mid morning I was firmly reminded that I needed to get back on track with the 5:2 diet when my pre-Christmas order from Holland and Barratt arrived. I’ve bought more of the shirataki noodles I tried a month or so ago…and a ‘rice’ substitute made with the same yam (a large portion of ‘rice’ for 7 calories!). But today was already half planned out in my head this morning. I’ve made a spicy tomato and lentil soup but cut the lentils down to 15g and included an extra stick of celery. I also used dried chilli flakes because I didn’t have a fresh one, and added a bit of smoked paprika. Using low calorie vegetables to thicken your soup is a very good way to fill up, increase the amount of fibre you are eating and reduce the calories a bit more. Reducing the amount of lentils should have cut 10-15 calories per portion from the soup, although I did end up eating a couple of bowls (total 120-130 calories) for lunch. 1 teaspoon Olive Oil Best possible quality. Cut the potato into small segments. Tonight’s supper totals about 250 calories with one small potato and 50g of salmon. It is reasonably filling and leaves me enough calories for a bed time snack or even another bowl of soup! I’m looking forward to getting Michael Mosley’s book The Fast Diet which I’m hoping will help with the meal planning. And to trying some more recipes with the Shirataki noodles I’ve got. And, just for laughs, I’m going to review a restaurant on Monday which serves a three course menu with a calorie count under 500! I was doing the every other day diet basically the same principle but as the name says you fast with under 500 cals every other day, to say I did not stick to it so hopefully the 5/2 diet should be better suited to me. Thanks for the meal ideas. I just started the 5:2 today, having thought about it since the TV programme last year. I’m about 1st overweight but my aim is to reduce my waistline by 3 inches – that’s where most of the extra is! I’m not as mobile as I’d like to be but I don’t sit about a lot and hope to walk more, even if it is fairly gentle. I’ve found your ideas and recipes so helpful in planning some meals, expecially the 500 cal ones, so thank you very much for the encouragement. I have to admit, Fiona, most of your 5:2 meals don’t seem that appetizing to me. I’m a bit of an eater. 🙂 This one looks delightful, though. I love almost anything with salmon in it. 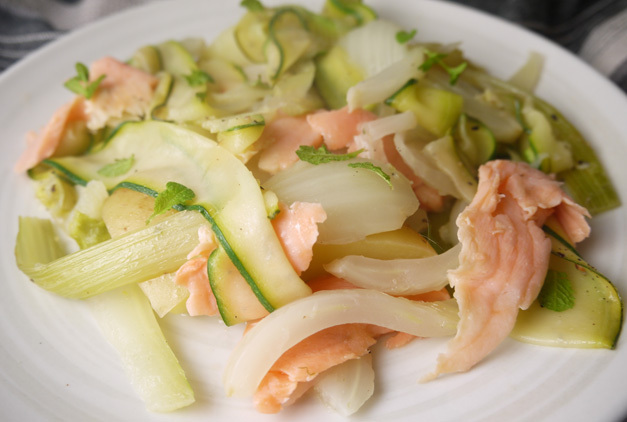 well you know it’s back to that lovely fennel and smoked salmon salad you made…! Happy New Year, Fiona! I love that you share your wonderful low cal creations with us. I’m back on my healthy eating plan too. I did manage to weather the holidays without any weight gain, but that was mostly from the pneumonia and fever so I didn’t really feel much like indulging, LOL. 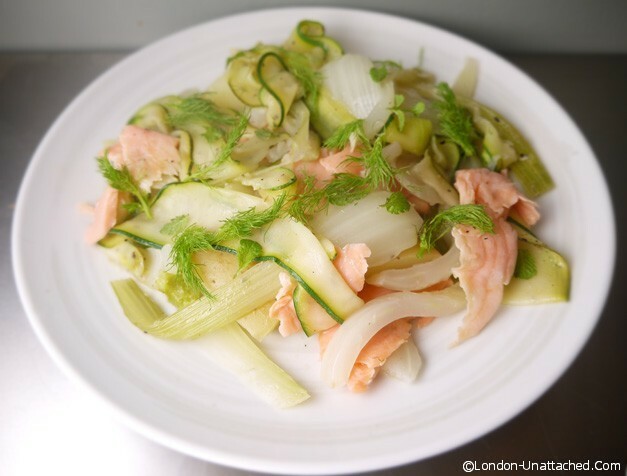 This is such a great blog; thanks for sharing your recipe ideas. I am beginning the 5:2 diet on Monday and will be blogging throughout. Hope to link to your tips and recipe ideas. Thanks once again for a lovely recipe. Simply does it best!